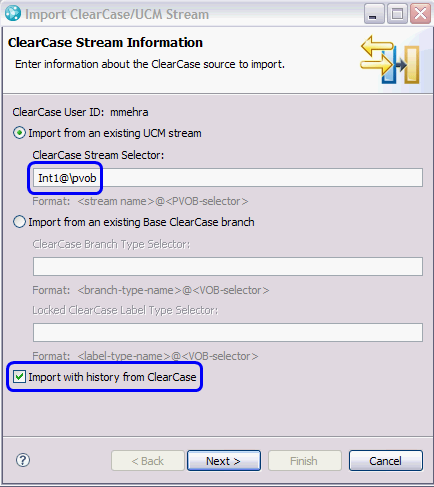 The ClearCase importer allows ClearCase users import VOB data with some limited history into Rational Team Concert. ClearCase UCM users can import all or a pre-determined set of baselines created in a UCM stream into Rational Team Concert, and base ClearCase users can choose to import a pre-determined set of label types applied to interesting versions in the VOB. Prerequisites: The ClearCase Importer uses the same user interface as the ClearCase Synchronizer and is based on its familiar semantics of importing synchronized streams, defining synchronization roots and running sync jobs periodically. However, unlike the synchronizer, which synchronizes changes in both directions (between Jazz and ClearCase VOBs), the importer only synchronizes in one direction, updating the Jazz repository with changes from ClearCase. It does not update the ClearCase repository with changes made in Jazz. Since the ClearCase Importer shares a lot of its implementation with the ClearCase Synchronizer, this article assumes that the user is familiar with its concepts and has already set up Rational Team Concert for importing ClearCase data and has configured a synchronization host. If you are not already familiar with these concepts, please see . This article also assumes that Jazz Team Server repository is configured and an RTC Client can connect to it using a valid user account. In addition, this article assumes that the reader is familiar with ClearCase UCM and base ClearCase concepts. Instructions in this article are in reference to setting up a host running the Windows operating system . Finally, the example in this article was created using the Eclipse Way process specification, which is no longer bundled with Rational Team Concert, but available for download on jazz.net. Articles supporting this use case for other process specifications will be available in the future. It should be relatively straightforward to adapt the example to whatever process you have deployed. A subset of baselines in the UCM stream. Baselines can be pre-selected by applying a ClearCase attribute type to them. Later when the user selects a synchronization root, they can specify the name of this attribute type. Only those baselines which have this attribute applied to them will have their content imported. 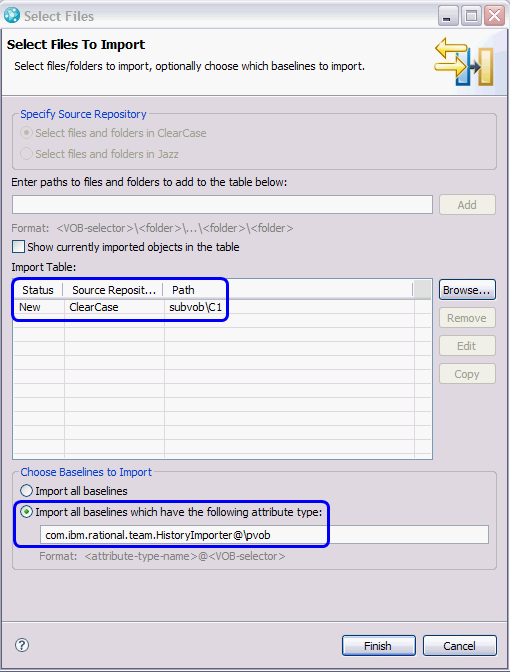 Method 1: In Rational Team Concert, choose File->Import->ClearCase Stream or Branch (under Jazz Source Control). Click Next. 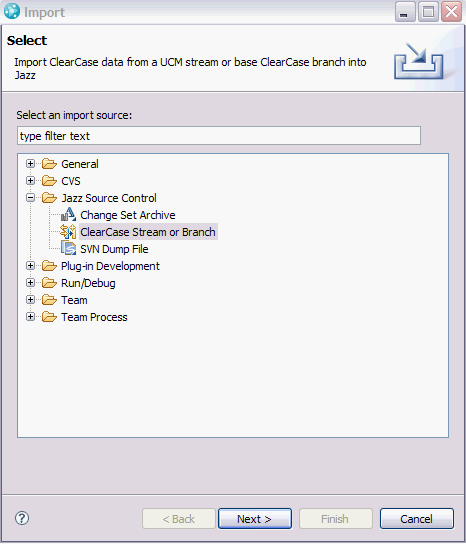 Method 2: In Rational Team Concert’s ClearCase Synchronized Streams view, click on hyperlink titled Import ClearCase data into Jazz. If this view is not visible, choose Window->Show view->Other->Jazz Source Control->ClearCase Synchronized Streams . Method 3: In Rational Team Concert’s ClearCase Synchronized Streams view, click on the Import ClearCase data into Jazz icon. Enter the name of the UCM stream for which history is to be imported. Click the Import with history from ClearCase check box to indicate that you want to import history. If this box is not checked, the synchronizer rather than the importer will be used. Enter a UNC path to a valid view storage area. Optionally, enter additional information for the storage directory. 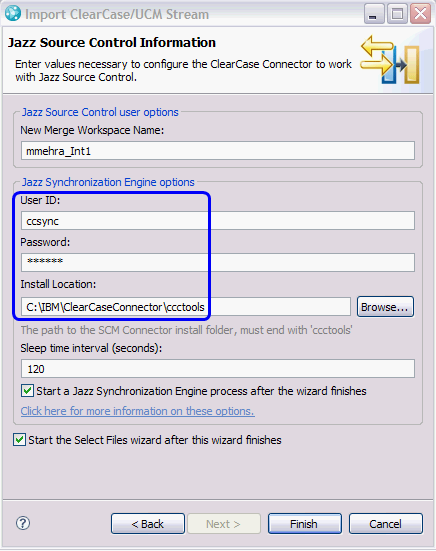 Enter values for the synchronization user ID and path to the ccctools folder of the ClearCase Synchronizer installation area. Choose other default values. Click Finish. The wizard creates a synchronized stream in Rational Team Concert and starts the synchronization process in the background. Once this is complete, bring up the Select Files wizard. Notice that the ClearCase Synchronized Streams view is populated with information about the UCM stream data just entered in the wizard. The Select Files wizard started by the import stream wizard allows users to select the synchronization roots (the set of files and folders to be synchronized). It also allows users to specify whether they would like to import all baselines for the component the sync roots belong to, or some subset of the baselines as indicated by a ClearCase attribute applied to them. For UCM imports, it is highly recommended that users select a folder that is visible in all baselines as a synchronization root . Select the root of a UCM component from which to import baselines. Choose the default option to import all baselines. The wizard sends an import request to the Jazz repository that is serviced by the synchronization process running on the synchronization host. Depending on the size of the component, number of baselines of the component in the stream and the amount of historical data available in these baselines, it may take from few minutes to a few hours (or even days) before all UCM data is imported into Rational Team Concert. Wait for the synchronization request to be completed. To select a subset of baselines from the list of all baselines for a given component in the UCM stream, users first need to create a ClearCase attribute type and then apply it to the baselines they would like to import. 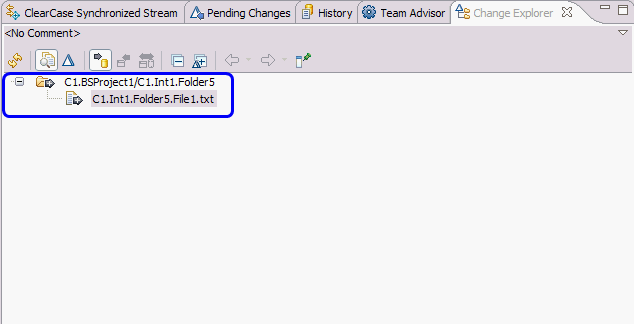 The attribute type must be created in a VOB that is in the component’s administrative hierarchy. The attribute’s vtype must be string or integer and its value should be any valid string or integer (A suggested value is true). Select the root of a UCM component whose baselines will imported. Choose the option to specify the baselines that have an attribute. Enter the name of the attribute type. Click Finish. Similar to Section 2.2.1, the wizard sends an import request to the Jazz repository that is serviced by the synchronization process running on the synchronization host. Depending on the size of the component, number of baselines of the component in the stream that have the attribute applied to them and the amount of historical data available in these baselines, it may take from few minutes to a few hours (or even days) before interesting UCM data is imported into Rational Team Concert. 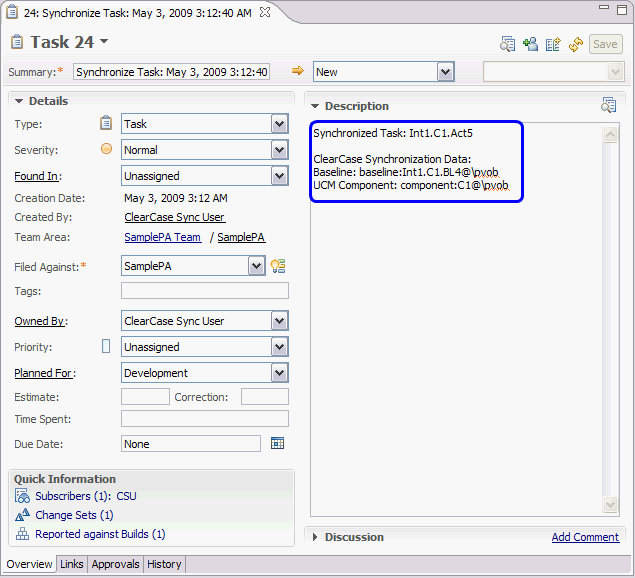 Once the synchronization request is completed by the synchronization process, the newly imported component shows up as an incoming change in the Pending Changes view on the merge workspace created by the import stream wizard. Right-click the component and select Show->History. Double click any history item in the History view to look at the details of the change in the Change Explorer view. This view shows the change applied to the Jazz repository for this component in the synchronized stream. 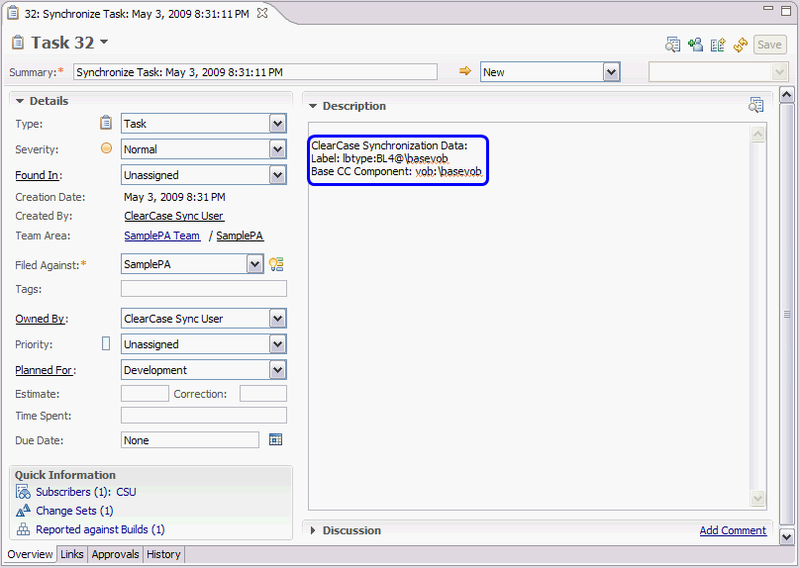 Right-click the history item in the History view and choose Open Work Items. Notice the Work Item editor view open for this work item. The work item contains useful information about the UCM activities imported in this change set. In addition, it describes the UCM baseline that contained these activities for back reference into ClearCase. 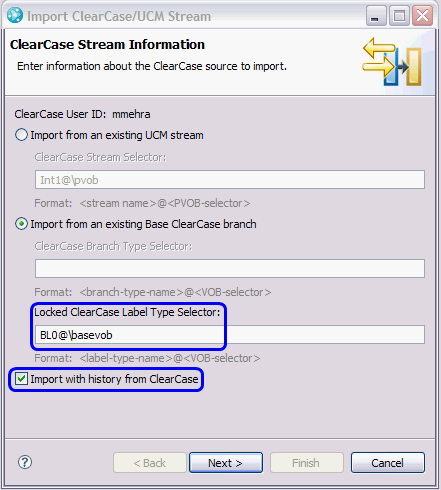 When importing base ClearCase history, attribute values signify the order of processing of the label types. The importer sorts all available label types based on their attribute values and starts processing the type with the lowest value. For this reason, the lowest value must be applied to the “backstop” label type that will be used for the creation of the synchronized stream. (“Backstop” just means the earliest label to be imported, and is the label specified on the first page of the import wizard.) All other label types to be imported must have values in the increasing numerical order as shown above. Finally, all the interesting label types must be applied fully to the file-system hierarchy in the VOB (starting from the VOB root) and must be locked prior to import into Rational Team Concert by the Base ClearCase History Importer. 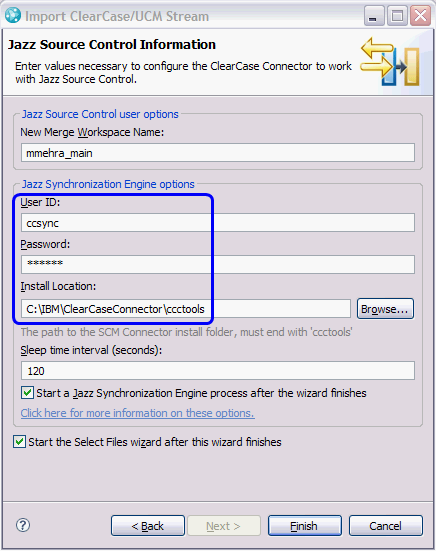 NOTE: Unlike the base ClearCase Synchronizer, the base ClearCase Importer does not need a branch type at the time of creation of the Synchronized stream, because the specified branch type is used only to update the ClearCase repository with changes made in the Jazz repository, which the importer does not do. 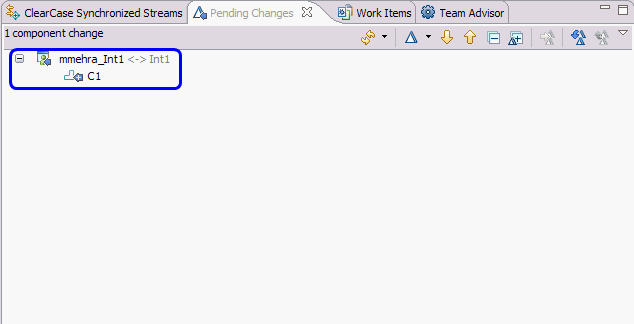 Follow one of the 3 methods as listed in Section 2.1 to bring up the import stream wizard. Select Import from an existing Base ClearCase Branch. Enter the name of the backstop label type for the synchronized stream. Click the Import with history from ClearCase check box to indicate that you want to do an import. Not selecting this box will assume use of the synchronizer. Wait for the wizard to create a synchronized stream in Rational Team Concert, start the synchronization process in the background and finally bring up the Select Files wizard. 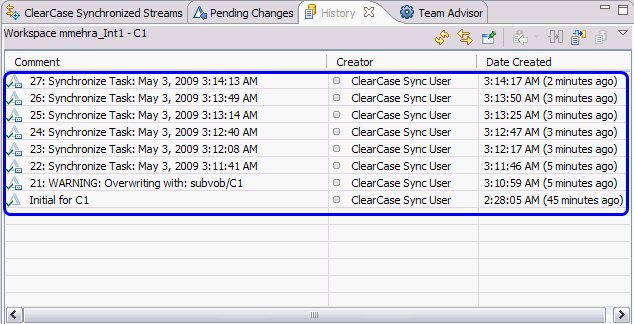 Notice that the ClearCase Synchronized Streams view is populated with information about the base ClearCase synchronized stream data just entered on the wizard. 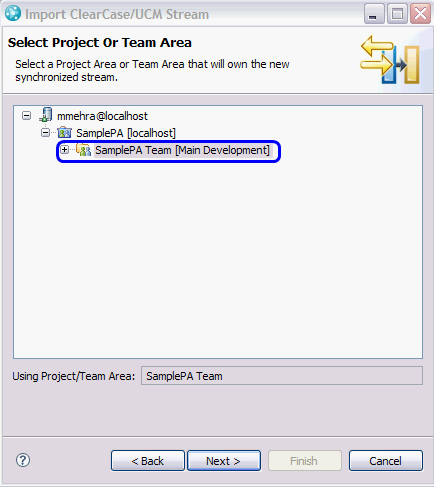 The Select Files wizard started by the import stream wizard allows users to select the roots to be imported (called “synchronization roots.” It also allows users to specify the attribute type used to tag the subset of label types to be imported. 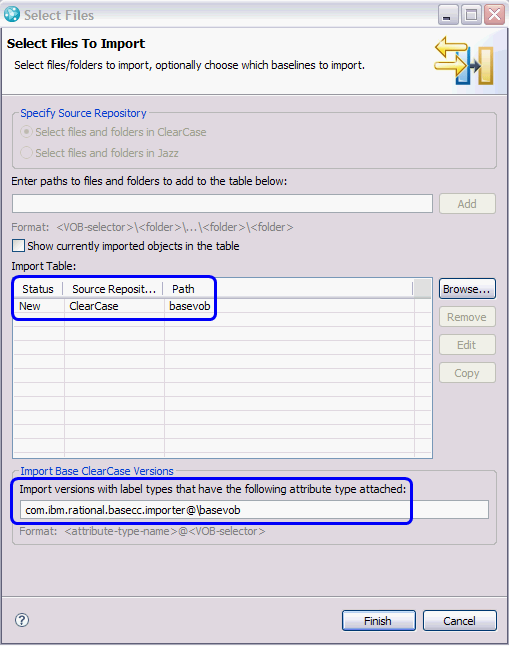 For base ClearCase imports, it is highly recommended that users select a as a synchronization root a folder that is visible in all label types to be imported . To select a subset of label types from the list of all label types in a given VOB, users need to first create a ClearCase attribute type and then apply it to the label types they would like to import. The attribute type must be created in a VOB that is in the VOB’s administrative hierarchy. Select the root of a VOB from which to import labeled versions. Enter the ClearCase attribute type. Click Finish. The wizard sends an import request to the Jazz repository that is serviced by the synchronization process running on the synchronization host. 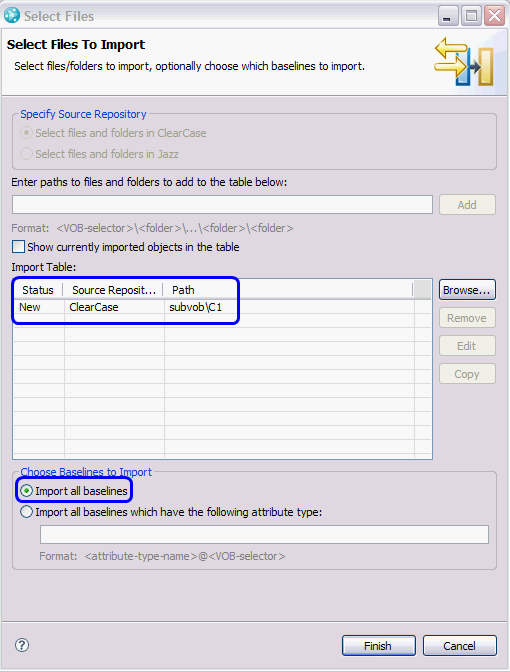 Depending on the size of the VOB, number of label types that have the attribute applied to them and the amount of historical data tagged by these label types, it may take from few minutes to a few hours (or even days) before all requested base ClearCase data is imported into Rational Team Concert. After the synchronization request is completed by the synchronization process, the newly imported component appears as an incoming change in the Pending Changes view on the merge workspace created by the import stream wizard. Right click on the component and select Show->History. Double click on any history item in the History view to look at the details of the change in the Change Explorer view. This view shows the change applied to the Jazz repository for this component in the synchronized stream. Right-click the history item in the History view and choose Open Work Items. The Work Item editor opens for this work item. The work item contains useful information about the Base ClearCase label type imported as a result of bringing over this change for a back reference into ClearCase. This section provides some idea of the times to expect to import files and folder using the importer. This is by no means a benchmark, but hopefully it will give some idea of what to expect when importing data using the importer. Your performance will also vary with the speed of the server host, database type, and synchronization host that you use. Additional data will be provided in the future as available. Tests on importing all baselines (222) and subsets of baselines (30 of 222 and 2 of 222) were performed. Was this information helpful? Yes No 3 people rated this as helpful.